Kisses on Her Christmas List Shannon Raleigh can't believe that billionaire Rory Wallace dislikes Christmas so much! 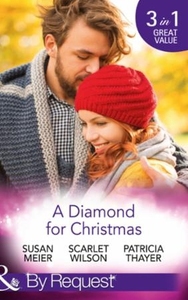 So when he saves her store, she's determined to make the season as magical as possible...but soon finds herself longing for his Christmas kiss! Her Christmas Eve Diamond Nurse Cassidy Rae is a stickler for rules, but even she revels in the magic of Christmas! This year however, new registrar Brad Donovan's surfer-boy charm is testing her goodwill to all men. But during the festive season, miracles do happen... Single Dad's Holiday Wedding When Lori Hutchinson inherits her father's company, business partner Jace Yeager doesn't think she'll last long! But as Christmas approaches, the sweet woman behind Lori's pinstripes begins to melt his heart...Perhaps it's the season for second chances?